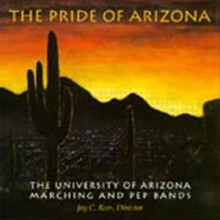 The “Pride of Arizona” Marching Band along with the “Pride of Arizona” Pep Band exemplifies one of the finest and most storied athletic band programs in the country. Representing the University of Arizona in Tucson, Arizona, the “Pride” has built its reputation on outstanding Performance(s), Respect for each other and the university, Integrity in all we do, Discipline of focus, and a relentless pursuit of Excellence. Our mission is to use the transformative power of music and the marching arts to entertain, educate, and elevate our students and audiences. 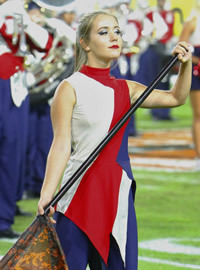 With over 250 members, the “Pride” includes a battery-unit drumline and award-winning auxiliary units of pom line dancers, baton twirlers and a flag and rifle color guard. 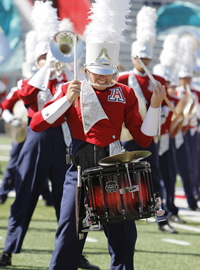 Filled with a sense of tradition and enthusiasm, the “Pride of Arizona” provides UA students an opportunity to make great music, new friends, and support the Wildcat spirit while discovering their own individual excellence in a group endeavor. The Pride of Arizona Bands are committed to the strategic vision of the University of Arizona in becoming a leading arts destination that fully embraces collaboration to fuel social impact, cultural development, and economic growth in our community, our state, our nation, and worldwide.